We had planned to discuss Yavanna and the Ents. Belanos had requested that topic, and she was sick this week. So that topic is moved to November. Lihan liked the slant that Elrond doesn't consider “heir of Isildur” a good recommendation. (The Humans may regard Isildur as a heroic king, but to the Elves he was just a stupid Human who blew a chance to save the world.) That gives Elrond a bit more personality. Both Elrond and Galadriel take the Ring very seriously, and don't want something that dangerous staying in their lands. We like seeing Galadriel portrayed as powerful and dangerous – someone the Hobbits and Riders of Rohan find scary. Both Elrond and Galadriel don't want to get too involved with the Ring, which fits with the Elves withdrawing from MiddleEarth. Why were the Elves withdrawing? Does it make sense for them to all leave? Remember that not all Elves were leaving MiddleEarth, only the High Elves – those originally from Aman. At the end of the Third Age, the only High Elves we know of in MiddleEarth were Galadriel (and Celeborn, if you go by the version of the story in which he was Teleri). The Sindar and other Elves who had always lived in MiddleEarth stayed. It is not clear why Elrond was leaving; he was Sindar. His deceased wife was Noldor, so he may have wanted to go to Aman to be with her. If there were any low-ranking Noldor left, it would make sense that they had joined Elrond's household, and would want to return to Aman. Although Legolas (and Gimli) later sailed to Aman, Legolas' family were Green Elves, and would have all stayed in MiddleEarth. People generally liked Gimli as comic relief. Reactions to Faramir are mixed – some people prefer the book version and some the movie version. Although at first it might seem that Faramir refusing the lure of the Ring makes his brother Boromir look weak, remember that Boromir was exposed to the Ring for months, and Faramir for less than 24 hours. The scene with the Nazgul in Osgiliath makes no logical sense. AelKennyr Rhiano: I know she wanted to be here, too. Lihan Taifun: so, do we want to save Ents for next month? do we have any alternate topics? AelKennyr Rhiano: I thnk we should save the Ents for when she is here? AelKennyr Rhiano: I hear people complain about LOTR the movies...and how they do not agree with the books. Lihan, how do you feel about the movies? especially how Gandalf and the elves are protrayed. AelKennyr Rhiano: What about Celeborn and Galadriel? Lihan Taifun: and both Elrond and Galadriel have a strong streak of "keep the ring moving, don't leave it here to bring trouble to our realm"
Lihan Taifun: I thought it made sense that Galadriel came across as very powerful, and someone hobbits found scary, someone the Riders of Rohan would consider an "elvish witch"
Lihan Taifun: isn't that Sam's line? AelKennyr Rhiano: but they are a part OF the world, and for them to voluntarily leave .....all of them...no, I don't find that plausible. People tend to want to remain with what they know, not change to what they don't know. AelKennyr Rhiano: But the Eldar had been gone for centuries, right? Elrond is not, for example, an eldar, is he? Lihan Taifun: Elrond is mostly Sindar -- yeah, so why is he leaving? AelKennyr Rhiano: By the time of LOTR, are there any Eldars left in middle earth? AelKennyr Rhiano: I can't think of any others. Rajani Milton: I think Tolkien was trying to do a parallel with other myths, you know the kind where " this is why we don't see faeries any more, there are too many humans around now"
AelKennyr Rhiano: oh, ok...no, that makes sense, shawn. AelKennyr Rhiano: oh, that makes sense, Rajani. I think I have always misunderstood it. AelKennyr Rhiano: I liked how Gimli was portrayed in the movie. AelKennyr Rhiano: Well that is part of the old tried and true formula, to have some comic character. Lihan Taifun: it was certainly "formula"
AelKennyr Rhiano: It worked for shakespeare. AelKennyr Rhiano: Continually sustained drama and conflict without sometime to relieve it becomes quickly boring. AelKennyr Rhiano: And the reader's attention or viewer's will wander. well.....Gimli was not a true buffoon. AelKennyr Rhiano: I agree...and even Pippin has his heroic moments. although I agree with Shawn, Pippin comes closer. AelKennyr Rhiano: And so did Merry, but we see Merry grow and evolve faster. AelKennyr Rhiano: And he had a depth to him. Remember when he met Galadriel. AelKennyr Rhiano: and you know, if you take Shawn's Irmo...he is a remarkable character. and as Estelin, he gets poked at because of the "cooking"
AelKennyr Rhiano: And there is Ulmo...who can't get his hands to be proportional to the rest of his body advising Estelin on how to fit in. Lihan Taifun: "Ulmo giving bad advice"
AelKennyr Rhiano: That is because we didn't know that Klingons were descended from very tall dwarves. AelKennyr Rhiano: And yet Ulmo is very wise in so many other areas, but mortals...he may have observed them, but he still does not completely understand them. Lihan Taifun: true. 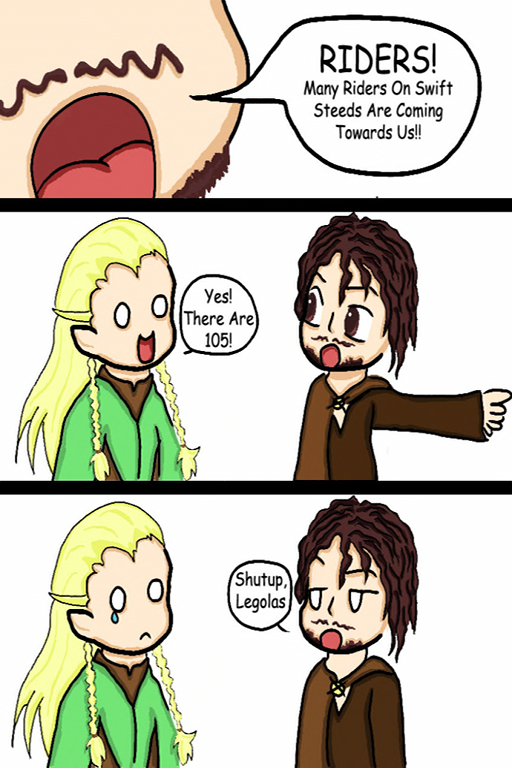 does Legolas ever do anything intended to be funny? AelKennyr Rhiano: that he plans to be funny or that is funny? AelKennyr Rhiano thinks some more. AelKennyr Rhiano: lol I don't think so. The elves seem rather humor impaired. AelKennyr Rhiano: It was more an unspoken challenge, and in the movies it was rather apparent that Legolas had not drunk much ale before. Lihan Taifun: The really controversial question: what about Faramir? Lihan Taifun: that has been a big point of debate about the movies: did they give a too-nice characters some personality, or did they make a decent guy into a jerk? AelKennyr Rhiano: Nor would I.
Lihan Taifun: is that in the third movie? AelKennyr Rhiano: I believe so. but I would not bet on it. Lihan Taifun: Frodo meeting the Nazgul in Osgiliath? That isn't in Movie 2? Lihan Taifun: and we have a topic for next session!